In Romanesque Revival style (1870 - 1900), the word “Romanesque” means descending from Roman culture and forms. Rome is a city in Italy and Italy is a country in Europe. Romanesque architecture is an architectural style of Medieval Europe that features rounded semi-circular arches. It was popular during the late 1800s. Many churches and castles were built during this time. 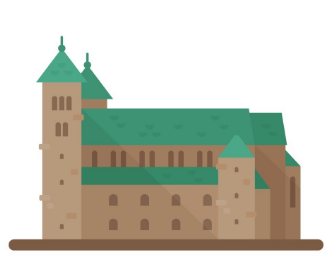 Romanesque architecture developed at a time when interest in religion was increasing. To accommodate for this churches became larger. Building large churches out of stone meant that the walls needed to be very thick and the windows needed to be small to prevent collapse.